Yet, UN missions still lack clear mandates to tackle organised crime one way or another and remain largely ill-prepared in terms of strategic guidance and analytical capacities. Therefore, they tend to revert to narrow securitised and technical law-enforcement assistance approaches, when broader developmental and political approaches are also needed. Peace operations are still largely flying blind when it comes to organised crime. This reflects the persisting disconnect between the growing international recognition that transnational organised crime cannot be ignored and the fact that the UN system and member states remain uncertain about how peace operations could approach the issue in a more strategic and coherent way. In December 2018, the Security Council listed the first three individuals under the newly established Mali sanction regime pursuant resolution 2374 (2017), two of which explicitly because of alleged implications in drug, oil and human trafficking. The UN experts’ report also clearly states that organised crime has been a driver of insecurity and is threatening the implementation of the Malian peace agreement, which therefore undermines the work of the UN Integrated Stabilization Mission in Mali (MINUSMA). The very first time the Council placed individuals on a sanctions list for human trafficking was June 2018 in the case of Libya — even though the Libya UN sanction regime has existed since 2011. Around the same time, a Small Arms Survey report highlighted the growing transformation of Libyan militias into criminal networks, and effectively announced the latest clashes in Tripoli, which violate the ceasefire the UN Support Mission in Libya (UNSMIL) helped broker last year. This broadening of the use of sanctions is part of a larger trend of the Council paying growing attention to the issue or organised crime. A study by the Global Initiative registered a steady increased in the number of Council resolutions related to organised crime in the past 15 years — with 41 in 2017 alone. This has included thematic resolutions, such as one each in 2016 and 2017 on human trafficking in conflicts. 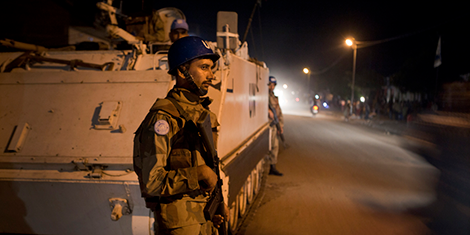 While UN member states have increasingly recognised the importance of criminal agendas in conflict management and post-conflict politics, organised crime remains a relatively new and foggy issue for peace operations. Three-quarters of current UN peace operations operate in environments that are considered significantly affected by organised crime. These range from small political missions without armed components in Guinea Bissau, Afghanistan, Libya, Somalia, and most recently Colombia (including unarmed military observers) to large multidimensional peacekeeping operations in Haiti, Kosovo, the Democratic republic of Congo (DRC), the Central African Republic and Mali. Mali is a good example of the Council foreseeing the “serious threats posed by transnational organised crime in the Sahel region, and its increasing links, in some cases, with terrorism”. But since it first deployed the peacekeeping mission in 2013. the Council has not yet given MINUSMA any specific strategic guidance on how to concretely deal with this problem. Resolution 2295 (2016) authorized a more “proactive and robust posture” by peacekeepers in an attempt to prevent asymmetric attacks but did not give any specific instructions on how to approach trafficking of weapons, drugs and humans, which have been linked to extremist networks. Five years into MINUSMA, this is still a relatively unambitious mandate when it comes to organised crime, but which nonetheless brings the issue to the strategic level. As mentioned above, the tendency is still for the Council to delegate the issue to little-resourced panel of experts mandated to monitor a sanctions regime. And while in Mali the threat of sanctions may have initially played a positive role in terms of signatory armed groups behaviour (wary of their reputation), the recent designation of some mid-level traffickers is unlikely to have any significant effect on traffics and related violence. Back in 2010 the Security Council already recognised that drug trafficking and transnational organised crime pose “serious threats” to stability in post-conflict countries and invited the secretary general to consider these threats in their conflict prevention strategies, conflict analysis, integrated missions’ assessment, mission planning and in its periodic reports to the Council. But the Council remains hesitant to give specific mandates to its peace operations. Less than half of the resolutions mandating these operations make reference to organised crime and fewer mandate UN operations to tackle criminal groups spoilers directly. The few that do are ill-prepared in terms of policy and strategic guidance from New York, as well as collection and analytical capacities on the ground. One limitation is that operations have not been mandated to “address the nexus between organised crime and national political or power dynamics, which increasingly constitute the driving force behind instability in various regions”. Although organised crime is obviously a challenge that extends far beyond the lifetime of a peace operation, failing to address the problem from the outset risks making it even more difficult to deal with later on, when it has penetrated the very state institutions the UN seeks to strengthen. Considering these challenges and given the absence of strategic guidance, the UN Police Division has taken the lead in promoting a law-enforcement, capacity-building approach to organised crime. Its February 2014 policy document explained that “addressing organised crime … is an important entry point for engaging with national authorities to take action”. The 2016 external review of the UN Police Division also suggested that a better evaluation of organised crime at headquarters was needed to help support field missions. After years of discussions of possible deployment into peacekeeping missions of Serious Organised Crime (SOC) units by certain member states, the UN Police Division finally created in MINUSMA its first dedicated (but multinational) SOC Support Unit. This consisted of more than 20 individual police officers dedicated to supporting the Malian authorities with training and equipment. Similar units have been created in the UN operations in the Central African Republic (MINUSCA) and the Democratic Republic of the Congo (MONUSCO). Historically, some of the more innovative UN approaches to organised crime have come from its regional offices. The West Africa Coastal Initiative (WACI), for example, has been praised for its regional approach, which combines a political element – encouraging political will to deal with the issue among regional heads of state – and an operational element, consisting of building units to combat transnational organised crime in Sierra Leone, Liberia, Côte d’Ivoire, Guinea-Bissau and Guinea. In general, the Security Council has approached the issue from a narrow security and stability lens, which is certainly part of the problem. Organised crime and trafficking are indeed most often seen in terms of their relation to terrorism, through a narrow law enforcement assistance approach, which is not always helpful for developing more holistic and sustainable approaches to the problem. Going forward, peace operations need to be both more ambitious and more realistic about their approach to organised crime. More ambitious because law enforcement approaches need to be part of broader strategies which include developmental and political components. UN peace operations’ strength lies precisely in their integrated nature (political, police and military, and economic development) which should – at least in theory – enable them to develop more effective medium-term stabilisation strategies which factor in organised crime and trafficking. To ensure that efforts are not in vain, such strategies need consider the political economy, corruption in state institutions, and the political will (or lack thereof) of the host government. The Security Council should also foster better coherence between at least peace operations and sanctions. Research by UN University suggests peace operations should adopt a more holistic crime-proofed, peacemaking approach to protect electoral processes from penetration by criminal financiers and tailor sanctions to address the connections between crime and politics. Granted, not every peace operation deployed in an environment affected by organised crime needs to make the issue a top priority, and a UN mission can never tackle the issue alone. But whether and how to tackle organised crime, and who the partners should be, are decisions that should be based on informed analysis. This is why peace operations should also be less ambitious and focus on what they can realistically do in the short term they are deployed with the capacities they have and/or can realistically acquire. The kind of offensive military mandate against criminal spoilers given to the G5 Sahel joint force (to which a police component is being attached), is probably not the most effective way forward for UN peace operations. It risks exposing peacekeepers to retaliations when they are already struggling to counter asymmetric attacks in places like Mali. It also risks threatening the livelihood of many civilians the mission needs acceptance from and is mandated to protect. Peace operations should therefore first develop a better multidisciplinary understanding of the issue and its impacts (including the insights of economists and anthropologists), with support from the UN Office on Drugs and Crime, INTERPOL and non-governmental actors, such as the Global Initiative. They must also partner with development actors to mitigate factors that bolster trafficking, while continuing to adapt traditional UN tools, such as mediation, to better deal with criminal agendas including at the local level. Last but not least, peace operations are also themselves not immune to corruption, and a growing body of literature suggests that criminal groups can in fact benefit from the stability that operations bring, and from the business opportunities – both licit and illicit – that UN procurement and sanction regimes provide. At the very least, peace operations need to improve risk management and due diligence to avoid feeding the criminal beast. Author’s note: This article draws from the book chapter “Peace Operations and Organised Crime: Still Foggy?” in United Nations Peace Operations in a Changing Global Order, edited by Cedric de Coning and Mateja Peter (Springer Nature, October 2018) (with Stephanie Tiélès). Arthur Boutellis is non-resident senior adviser at the International Peace Institute (IPI), adjunct professor at Columbia University, and a member of the Global Initiative against Transnational Organised Crime.